We spent the day with some friends in Porvoo, a quaint small city some 50km east of Helsinki – it’s a rather charming place, especially in the summer, largely thanks to its old town area dating from centuries ago and a nice location by a rivermouth. 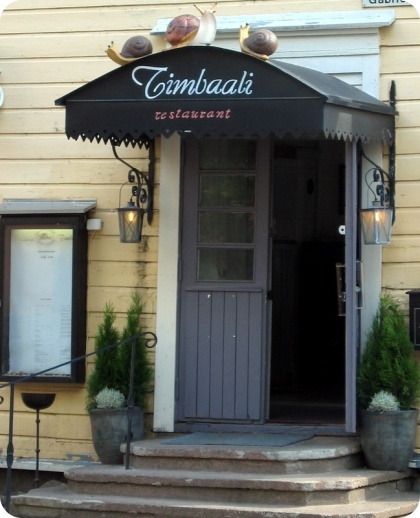 For lunch, we went to Ravintola Timbaali, a place where we had eaten a couple of times before and if memory serves us right, had enjoyed immensly. It’s situated right in the heart of the old town with rustic interior and a nice covered summer inner courtyard where we sat to enjoy the sunny and balmy, +25C weather. We managed to secure a table minutes before the restaurant was packed with people (many of them foreign tourists on a daytrip) and more in waiting mode queuing outside. Reservations for the summer evenings are a necessity, I’m sure. Timbaali is best known for its snails, which are home-grown and come in a number of different varieties. 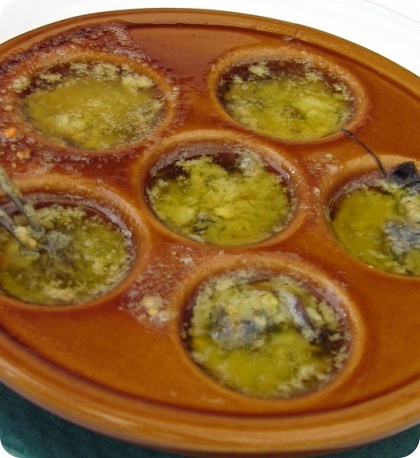 Despite their staple food, it turned out Sarita was the only one who went with snails by choosing six snails in parmesan pistachio-butter (€9,80). Not a big fan of molluscs myself, I can only take her word that they were delicious. The rest of us, it being lunch and all, actually skipped all appetizers, despite our waitress’s good attempt in trying to lure me into a Kir Royal after hearing me mention it.. To a potential horror of old-fashioned wine drinkers, we chose a bottle of the house white wine, a thoroughly delicious Chilean Morand? Pioneo Chardonnay (€28,50), despite all of us ordering meat as a main course. The wine list was obviously a careful selection of suitable wines with our Chardonnay being the perfect, lively wine for a warm summer day. For the entr?es, I chose a fillet of beef with herbs and smoked potato bundle (€23,20, below first) while Sarita went with fillet of red deer with a bolete bake and roasted shallots (€23,80, below second). Both were, for the lack of a better word, perfect. 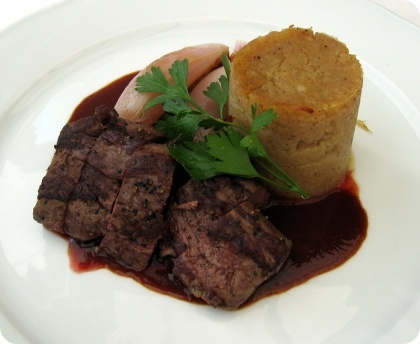 My medium beef was exquisitely cooked, savory and wonderfully tender. 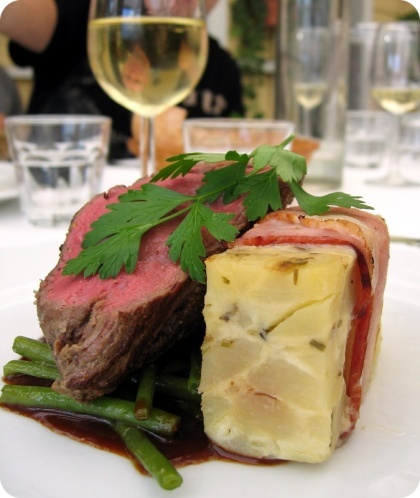 Really wonderful, simple dishes of great quality – by far the best meat I’ve had in a long time. For dessert, all of us were unanimous in that it was Cr?me brûl?e (€6,50) that we wanted to try – a good choice, although I doubt the other ones would’ve been any worse. 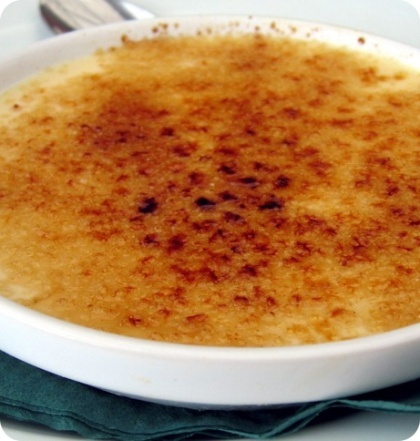 The brûl?e was beautifully caramelized and perfectly moist, making for a delicious finish for the meal. Overall, quite possibly the best lunch I’ve ever had, at least in Finland. If in Porvoo, this is the place to go to – even if you’re not a snail-fan. Tuleepa vahva deja vu -tunne jutustasi, s?in tuolla sunnuntailounasta tuskin kuukausi sitten. Meill? oli erinomaista onnea tarjoiluhenkil?kunnan kanssa. Osuin eri ruokiin kuin te. Meid?n annoksemme – etanaquiche – oli hiukan v?s?ht?neen oloinen, mutta maukas, etenkin jos malttoi nostaa sivuun kaamean t?lkkilihalta maistuneen savukinkunsiivun. Sen sijaan ruoan lisukkeena tarjoiltu tomaattisalsa oli niin hyv?? ett? sit? tekee edelleenkin mieli, viinisuositus (rieslingi??) nappiin osunut ja milj?? oli tosi mukava. Well, I can’t say I am a snail fan, but I would love the dessert. They seem to have a thoughtful approach to food here.